This beautiful and folky homemade flag of the Civil War period descended in the Kilbourne family. By the time of the Civil War, commercial manufacturers and cottage industry flag makers were producing large numbers of American flags for sale to the government and to private citizens. Americans also produced their own homemade flags from materials at hand, and these rare homemade examples often possess wonderful folk art qualities, as is the case with this example. This flag is entirely hand sewn and made of thin cotton. Families took great pride in ownership of their family flags, carefully repairing damage to them by patching, re-stitching and darning them. The Kilbourne family repaired their flag using patches made from scrap cuttings of fabrics resulting in a wonderful make-do appearance. The hoist of the flag consists small brass ringlets and a rope sleeve with the thin hemp rope still present. The rope is sewn into the hoist and was not for hanging the flag, but simply to strengthen the flag along the hoist to prevent the ringlets from tearing the thin cotton. The star pattern of the flag appears at first to be random, but there are some hints of underlying structure to the pattern, and as seen in the image to the right. In fact, the pattern is very close to a spiral configuration. With the exception of just two stars in the upper right quadrant of the canton, which are slightly out of position, the remaining 32 stars fall neatly into the spiral, and it's probable that the seamstress, when positioning the stars, worked her way out from the center, placing the stars to fill in the spaces as she spiraled around the canton. Although the spiral pattern was probably unintentional, it is present nonetheless as a result of her technique. The stars are double-applique and appear in the same pattern on both sides of the flag. Yet another rare attribute for the flag is the fact that the canton rests on a red stripe, known in flag lore as the "blood stripe". 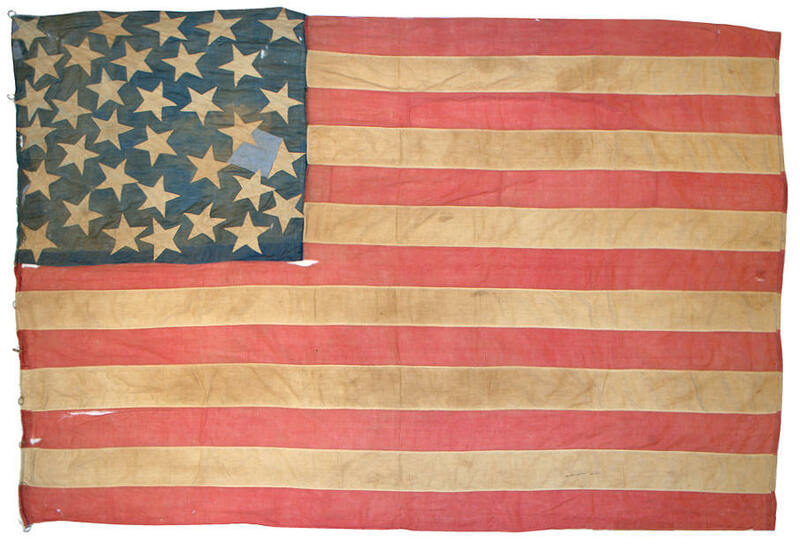 This feature is often attributed to a flag being made in wartime, and may certainly be the case for this flag, being made in the opening years of the Civil War and possessing provenance to a family with two sons who fought for the Union cause. 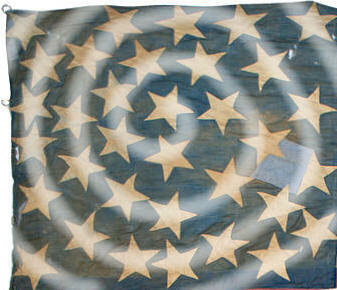 Evidence of a spiral pattern in the design of the Kilbourne family flag, circa 1861-1863. Learn more about the "Blood Stripe". Learn more about flags from the American Civil War.